About seven-in-ten (69%) of Americans say there is solid evidence that the earth’s average temperature has been getting warmer over the past few decades, according to our survey conducted in March. Among those who see evidence of global warming, more say it is caused mostly by human activity (42% of the public) than by natural patterns in the earth’s environment (23%). Nearly three-in-ten Americans (27%) say there is no solid evidence of warming. These opinions are little changed from last fall. 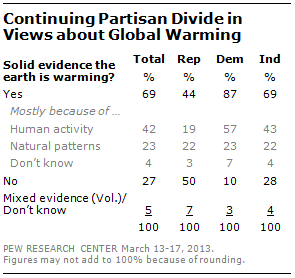 But four years ago, just 57% saw solid evidence of global warming and 36% said it was mostly caused by human activity. There has been a sizable partisan gap in views about whether there is solid evidence of global warming since the Pew Research Center began asking this question in 2006. In the March survey, almost twice as many Democrats (87%) as Republicans (44%) say there is solid evidence that the average temperature on earth has been rising.